Coming from a small town and having my grandparents being farmers created the person who I am today. I’ve spent all my summers, winter breaks and even spring weekends on the farm. I knew my grandparents worked pretty hard at their farm, but for me there was something romantic and idyllic about being in the country. Just the idea of waking up in the morning and smelling summer was all I needed. I’ve spent all my days helping my grandma feed the pigs and chickens, and watching her milking the cows. The sounds of evening crickets and frogs, caused a happiness and a feeling of freedom that I cannot describe in words. Everything, except for mosquitoes and potato picking, I loved. 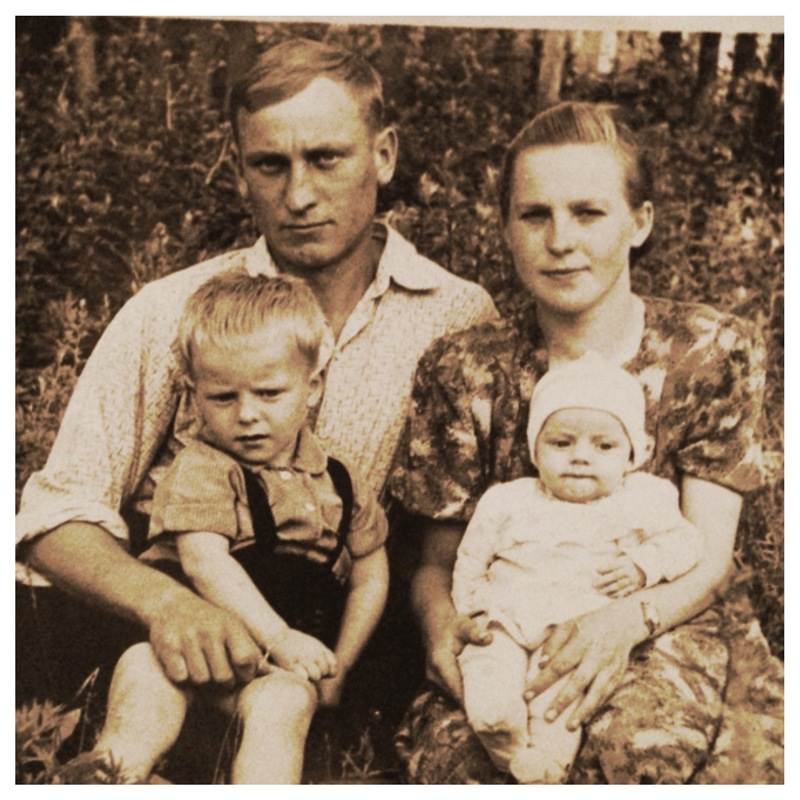 My grandparents made most of the things they needed: breads, jams, compotes, cheeses, baskets, etc. They were self- sustainable, with cows, chickens, pigs, potatoes, strawberries, and even their own tobacco. When I was 21, I moved to New York City. Working and being in college in the big city really made me miss my hometown, and the peace and ability to walk in my bare feet on the summer grass. Occasionally, me and my friends would go camping outside New York and one time I discovered the Berkshires. It was love from the first sight. And of course, there was a boy, but that’s another story. The abundance of beauty and locally grown food is very important here. 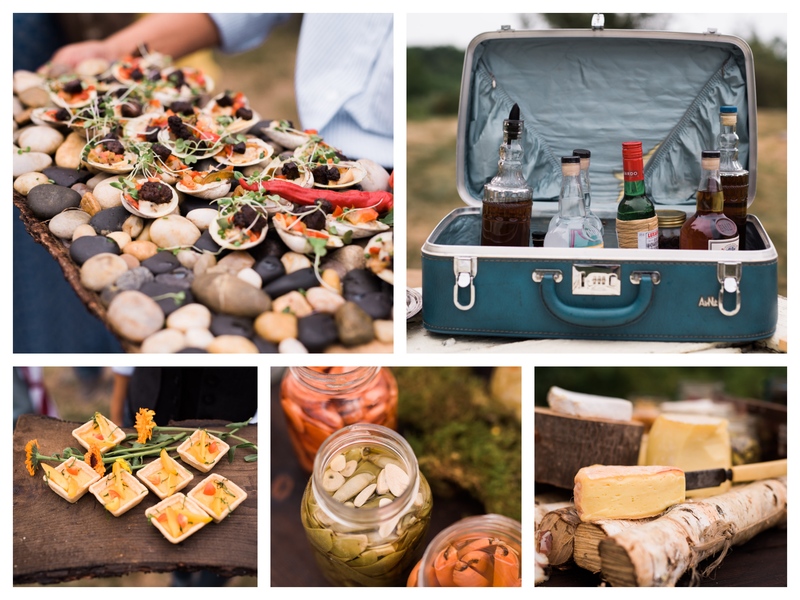 Together with Jim Gop of Heirloom Fire, we came up with the idea of creating dinners to promote local farms and products. We wanted to bring the whole experience to our guests, and give them something they would remember for a long time; like the smells and tastes from my childhood. 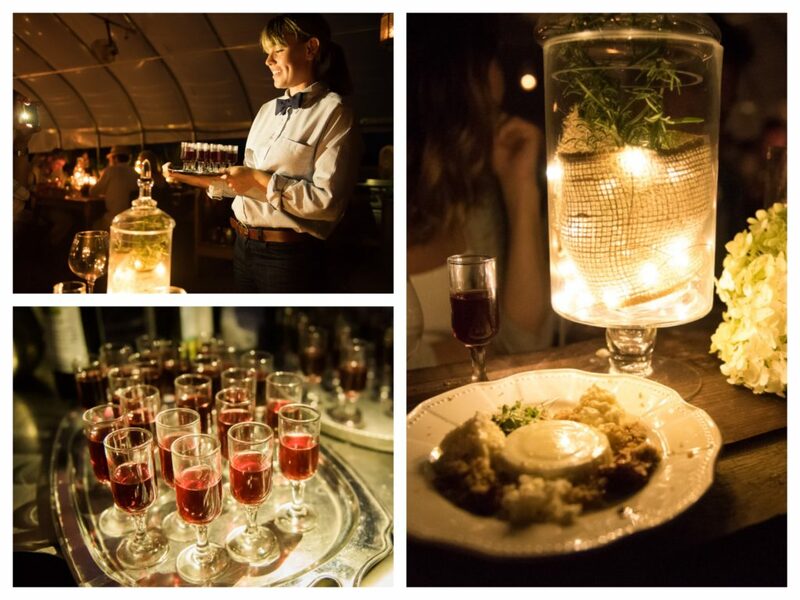 We wanted to elevate their experience by not only creating exciting food and drink experiences, but also bringing something special to the table. Literally. 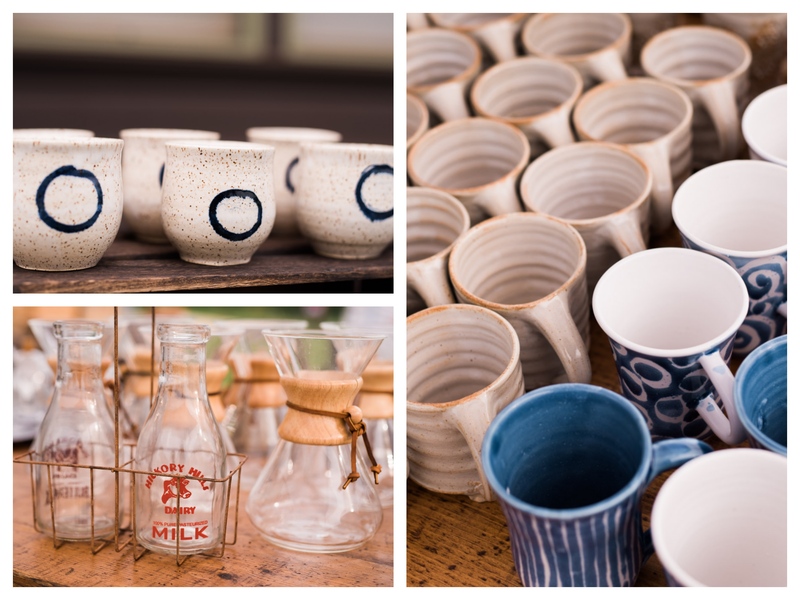 We asked local potters to collaborate with us on this event. 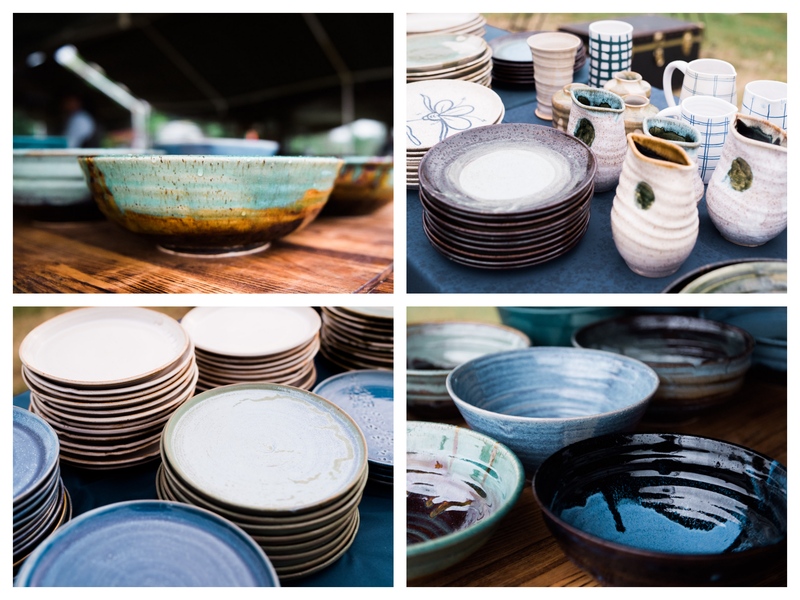 Jackie Sedlock Pottery, Stephanie Boyd Works, Suzy Konecky, Sandra Ware, and Amrita Lash produced various plates, platers, mugs and vases just for this event. They did such an amazing job with their hand-crafted, one of a kind pieces. 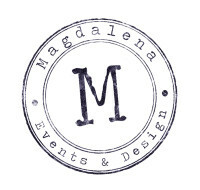 Every year we try to choose a different location and design an event around that place. It was Taft Farms last year and this time we chose Mill River Farm. 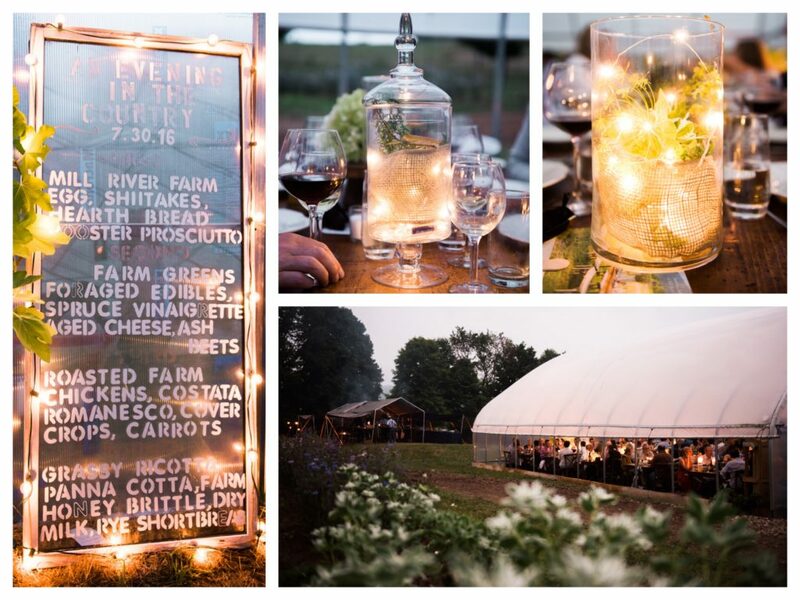 Jan Johnson, the owner of the farm, was thrilled with the idea of creating the dinner at her certified organic farm. 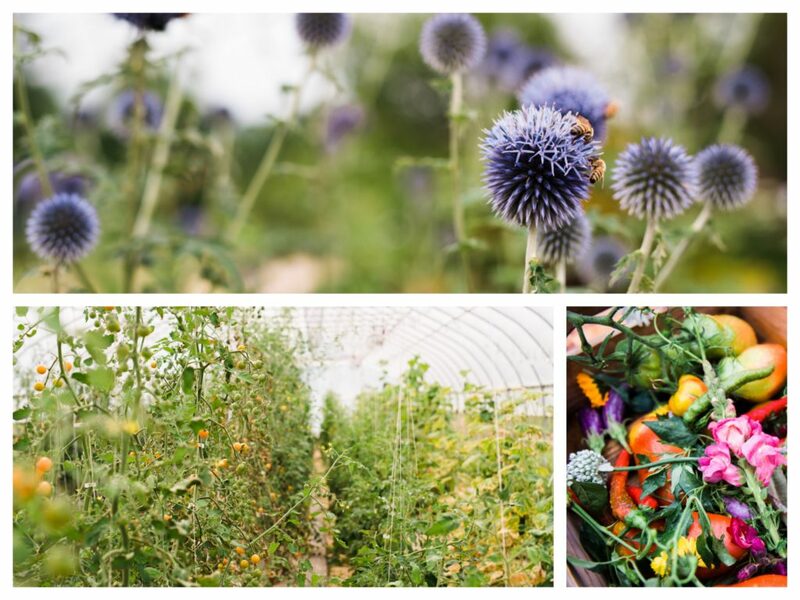 Mill River farm raises animals, vegetables, flowers and fruit, as well as honeybees. On Saturday evening the guests arrived at the farm and meandered around the property enjoying beautiful mountain views. The bar offered local beers from Big Elm Brewery, spirits from Berkshire Mountain Distillery and chamomile infused Moonshine (Brooklyn made) cocktail with Jan’s honey. Guests munched on the beautiful display of charcuterie cured by chef Jim, along with local cheeses, fresh and dried fruit—a simple prelude to the delicious meal that would follow. Due to the last minute forecasted rain, we moved all the tables into the green house. 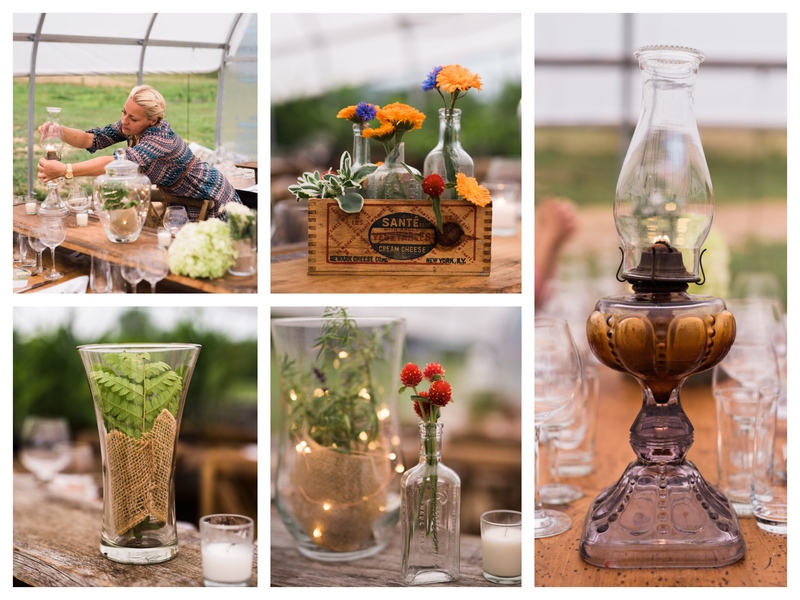 I set the tables with a range of herbs that had organic colors and patterns inspired by the farm. 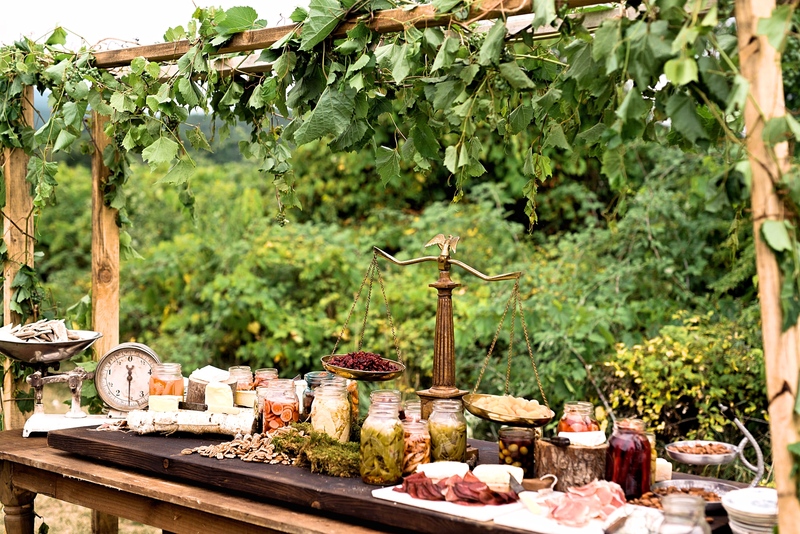 I incorporated rustic woods and natural elements into the setting for a casual complement to the almost alfresco scene. Jim’s menu was inspired by simple and seasonal Berkshire food, featuring the best ingredients in an easy-going style. 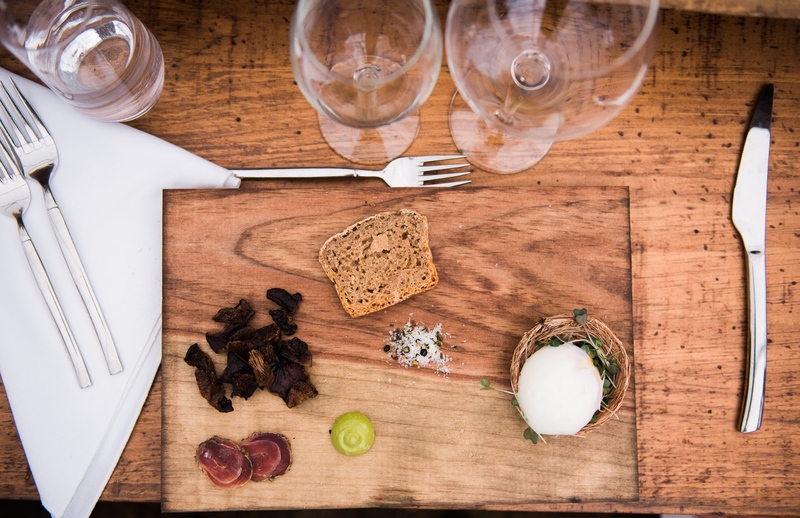 The four-course dinner began with a Mill River Farm Egg served in a ‘birds nest’, hearth bread, wood shiitakes, and rooster prosciutto. The course was paired with a local Glass Bottom Brewery beer, called Parsnipity, a fusion of a Belgian tripel and a country wine brewed with parsnips and sugar. Parsnips have a unique spicy, earthy character-a perfect complement to an egg dish. 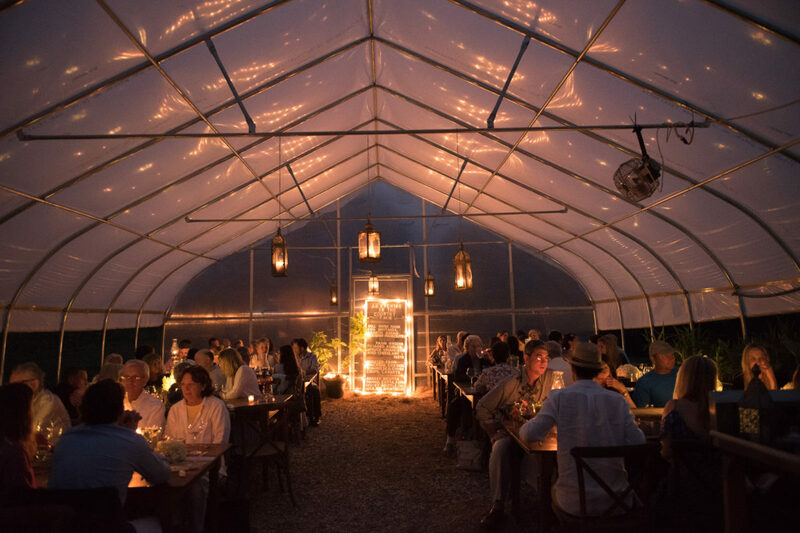 The first course was followed by heirloom farm greens, foraged edibles, spruce vinaigrette, aged cheese and ash beets paired with Graham Farmhouse Pinot Grigio from West Stockbridge, MA. 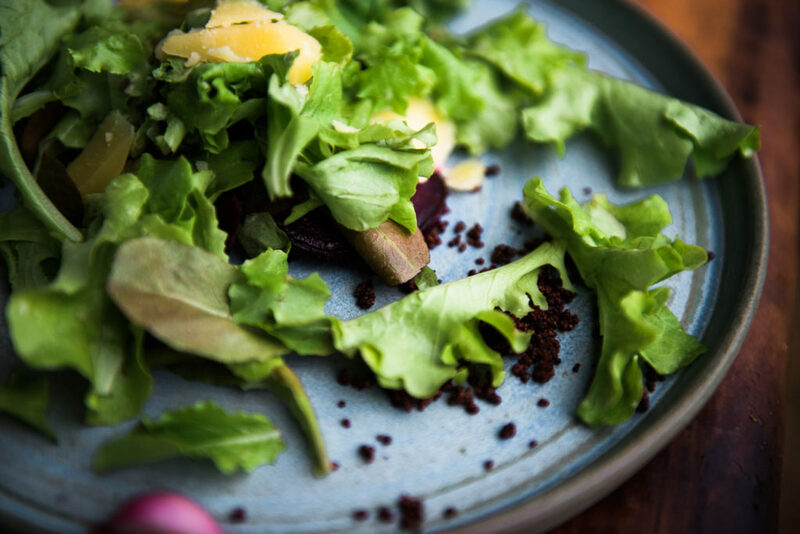 The refreshing elements of the wine perfectly complemented the ash cooked beets and spruce notes of the salad, each flavor becoming fuller when juxtaposed. The main course, served as family style- hearth roasted farm chickens- were a crowd-pleaser. Sides consisted of heirloom costata Romanesco, cover crop risotto, which was accompanied by colorful, summer carrots. 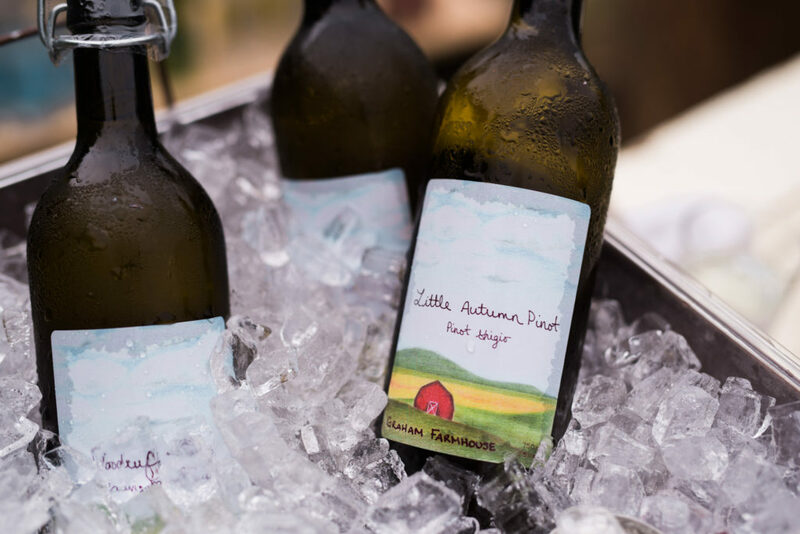 Paired with a delicious Millbrook Pinot Noir—the course had something for everyone. 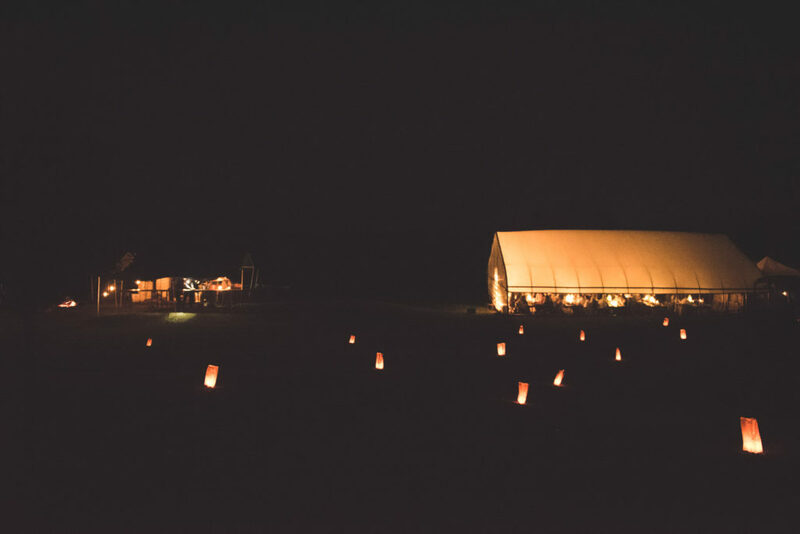 As the sun descended, the strands of fairy lights inside apothecary jars adorning the interior of the green house and lanterns hanging from the ceiling added a wonderful warm glow to the magical evening. The meal was finished with a beautiful grassy ricotta panna cotta, farm honey brittle—a wonderful tribute to Jan’s bees, and rye berry shortbread. And, of course, with the dessert came my homemade berry cordial. And here’s the story why (I think I mentioned it in my previous blog). I remembered my grandfather making the most delicious cherry or berry brandies. It was always served at the family gatherings and, as a little girl, I often sneaked under the table, waited for the right moment to steal some of the cherries. Sometimes, I was even able drink the rest of the liquid from the glasses. One time my grandparents caught me drinking the brandy from the glasses, but they didn’t say anything. Next time, they poured a tiny bit of a rectified spirit called Spirytus (192 proof!!!) which actually made up the base for grandpa’s brandies. They just waited… And I did drink it! Guess what happened next? I didn’t try any alcohol for the next 10 years. Even though I was tricked as a child, I still remember vividly the essence of the summer in every bottle my grandpa made. When I was older I started making my own concoctions and loved sharing them with others. At the end, the guests helped themselves to coffee roasted by our local and favorite No 6 Depot. The perfect Berkshire summer evening was completed with a local orchestra of crickets and cheepers playing softly in the background after the rain. 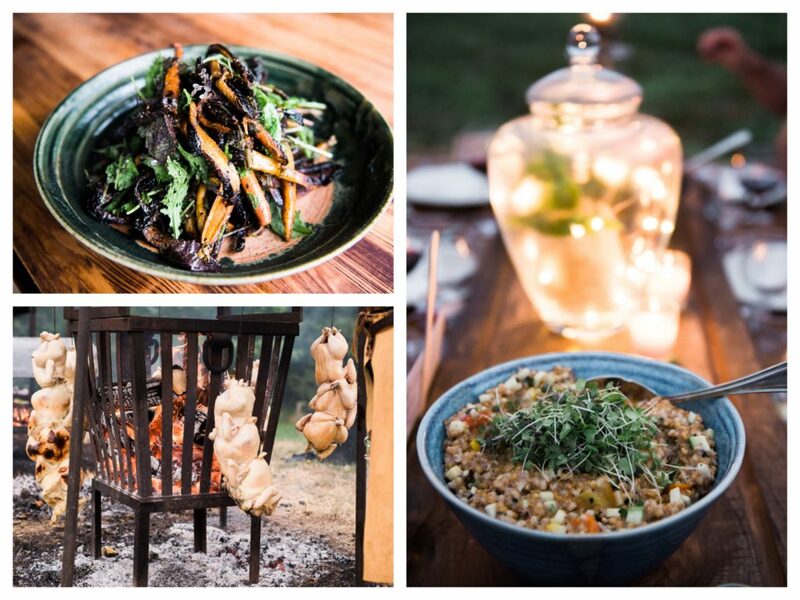 With the unique flavors, stunning presentations and local pottery, we could not have asked for a more perfect collaboration or a more remarkable evening. Those experiences bring the happiest moments of my life from the past to the present and I am more content when I create them for others.